My impression (and I can be wrong of course) is that entrepreneurship is revered in North America. So many young and bright people fresh from university have revolutionized the world we are living in. And some of them have succeeded after some very public failures (including a chronic incapability to graduate). I like this quote. Wouldn’t it be nice if some people bought 2M rupees cars instead of 5M and invested the 3M into some kind of startup where some bright people have ideas but no money? The country is in dire need of good entrepreneurs especially in the Web 2.0 sector. Elsewhere companies are being created by kids and being sold for billion of dollars after 2-3 years. When I was a student in France, I did two work placements at Technodigit and Sunopsis, two young startups which happened to be in a NovacitÃ©. Nothing more than an extremely efficient incubator in fact. The funny thing is that when I returned to Mauritius in 1998, I went to see the Minister of Information Technology of that time (it was Jeeha and, yes, I don’t have any respect for him) with the idea of telling him about the NovacitÃ©. Unfortunately, I was 25 at that time and I was naive. I thought that he was going to listen. But I was wrong. He made me wait for more than one hour and then sent his secretary to tell me that he couldn’t listen to me as he had to leave. The secretary asked me to come the next day. I came back on the next day and I waited for an additional hour. In the meantime, someone from his constituency had come to invite him for a wedding ceremony and that guy was asked to enter the Minister’s office first. I was taken aback. I didn’t want him to do something for me. I was bringing a new concept to him! I remember explaining him what a NovacitÃ© was. I’m not sure he listened. I left his office. And no one ever talked of NovacitÃ©’s afterwards with me. This was in 1998. 10 years ago. In my opinion, this was a missed opportunity for the country. Of course, I don’t know if Mauritius was ready to have such incubators at that time but, as I already mentioned many times, WE ARE NOT MORE STUPID THAN FRENCHMEN OR AMERICANS. What is missing here is a culture of entrepreneurship and some support. So if i got it well, The NovaciTe is basically like the ICT incubator of the NCB?? there are some Mauritian companies doing good hmm..
vinivi (well the founder is french, don’t know if that counts).. posterita..
What I know is that I went to see him in 1998 and the NCB Incubator was opened in January 2003. Frankly speaking, I don’t think he listened to me on that day. And that’s why I don’t respect him. As for showing respect to other politicians, Vicks, you should not generalize. There are politicians who are genuine but, unfortunately (but like in all other countries) there are some who only do it for prestige/money/power/etc. The importance of failure in Silicon Valley has been discussed for a long time. Here is an article dating back to May 2004.
you know who you are if you are reading this. Now as far as politicians are concerned… their main goal in life (if i noticed well) is to get more and more votes and become famous, to catch this type of fish, one must throw the proper bait :p, if you had an idea, however bright it may have been, you are definitely bound to fail to get their attention if you don’t have ‘votes’ behind your back), learnt this from my dad, :p if you can guarantee that you own a particular ‘region’ am sure they listen and they do whatever you want..
It’s almost impossible to make a Web 2.0 startup here in Mauritius… with a 128kbps connection. Very true, this impression is not only correct but the main reason the USA is still where technology happens: they attract the best brains, treat them as the best and have created the right environment for entrepreneurship, where a great idea can quickly be turned into a great company. “So many young and bright people fresh from university have revolutionized the world we are living in. And some of them have succeeded after some very public failures (including a chronic incapability to graduate). In Europe, the legalese around building a company is still a huge barrier (submitting a patent takes years and needs to be translated into 15 languages and costs a lot of money), the number of grants for promoting entrepreneurship is so numerous that would-be entrepreneurs get lost as to where to start from. Finally, to come back to your topic – the right to fail – when you have started up once, and experienced failure, banks or business angels rarely give you a second chance. And this seems to be the conclusion from the Newsweek article. …great businesses start from great ideas: you may have all the required infrastructure in the world but without the killer app, your business is doomed. On the other hand, no matter what the barriers are, a great idea will help you make your way and convince (provided you believe in it yourself). Therefore, young Mauritians, fight to turn your ideas into great ventures! PS: An insider’s view about the Motorola-Apple phone failure: this partnership was never really a strategic move from Apple. The ROKR phone was a plan from the then-new Motorola CEO to make use of his relationship with Steve Jobs and create buzz for Motorola. 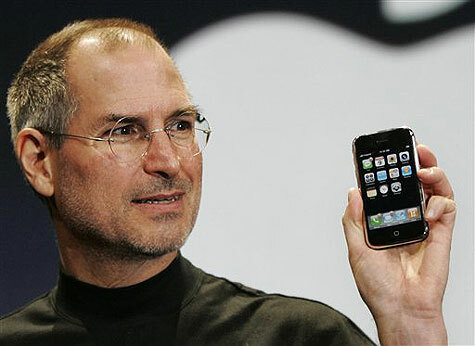 I think Steve Jobs’ interests were more obscure: he saw in it a good opportunity to get the details about how to design mobile phones, and incidentally get the right guys working on the iPhone. As a proof for this: (1) the iPhone has been a registered trademark for years, (2) in 2002 I met one of the pillars of hardware design on Motorola mobiles, in Libertyville, Chicago (Motorola’s Mobile Devices headquarters). Last year, I went there for other purposes, and wanted to meet this guy again, but guess where he moved to :-)? DON’T TELL ME HE MOVED TO APPLE !!! I, for one, would like to vote for the right to fail. As a matter of fact I think I’m going to do just that. YES, 100% with you, the french are afterall.. only human.